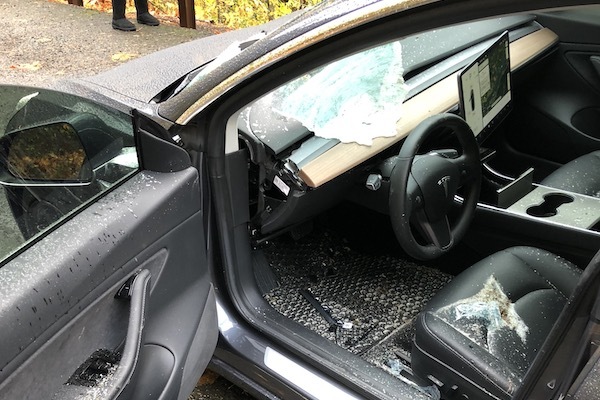 Jade Insko of Camas, Washington is grateful to alive after a large rock crashed through the windshield of his Tesla Model 3 earlier this week. The scary moment happened while he was traveling east on Highway 14 near Cape Horn when the rock made its unwelcome appearance. Insko immediately brought his Tesla to a halt to assess what had just happened, vacating the road so as not to be rear-ended by other cars. 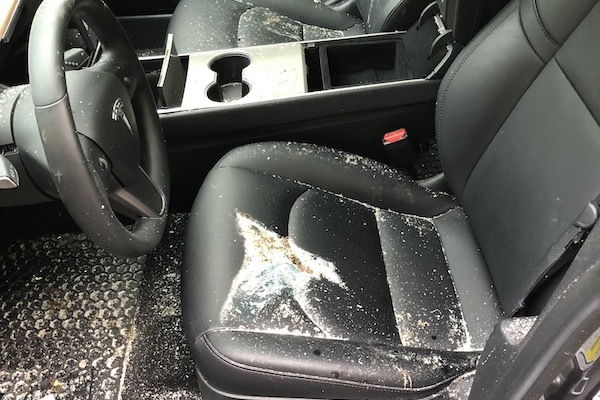 "Maybe a few hundred feet down the road from Cape Horn, when all of the sudden this rock blew through my windshield smashed into my dash and landed directly in the passenger seat beside me," Insko told Insko told KGW 8. "I just pulled forward slowly with my hazards on, I couldn't see anything, I had glass in my face and eyes and a giant hole in my windshield," he told Fox 12 Oregon. It was on the shoulder that Insko cleared his eyes to discover the stone sitting comfortably in his passenger seat, and his interior dusted with shattered safety glass. The dashboard was caved in from where the boulder had bounced off, and the Tesla's center-mounted screen was shifted by a brush with the rock. "There is a crossbar in the dash of the Model 3 which is fairly unique," Insko told The Drive, repeating what the body shop working on his car had told him. "If that hadn't been there, the rock would have probably passed through the dash and crushed one or both of my legs." Insko, his wife, and two children were all disturbed by the knowledge that the father and husband might have been taken from them in an instant. "I have a wife and two young children, seven and eight, and it hit them hard as well. Knowing that could have been, in an instant, the end." Previous incidents of falling rocks on Highway 14 have prompted the Washington State Department of Transportation to construct retainer fences to prevent incidents such as this, but Insko rightfully thinks more need to be put up. "Whether it's me or somebody else, this could be somebody not coming home in the evening, and so I think the public needs to be aware, I think the department of transportation needs to be aware. I know that particular area has rocks all the time." Insko promises to keep the 37-pound rock as a memento mori, and a reminder to be grateful for his life. "I'm gonna put it in the yard as a monument to how bad things could have been and to cherish life going forward," Insko concluded. Insko's Tesla Model 3 is rated as one of the safest vehicles ever tested by the NHTSA, and as outlined above, he could have been more seriously injured if not for the bracing beneath the dashboard. Sure, the repair of the Model 3 is likely to be costly given the high expense of performing work on Tesla vehicles, but that's why we have insurance. State officials say the bus more than doubled the bridge's maximum load capacity.